(L to R: Norfolk Councilwoman Andria McClellan, Norview Principal Walter Brower, James McClellan, Education Association of Norfolk President Phillip Hawkins, Jr., and California Casualty's Scott McKenna) James McClellan placed in a national contest. Norview High School junior James McClellan placed second in the national Create Real Impact contest receiving a $250 academic grant. NORFOLK, Va. (WVEC) — Just Think. It's a lifesaving message about safe driving that's paying off for one Norfolk teen. 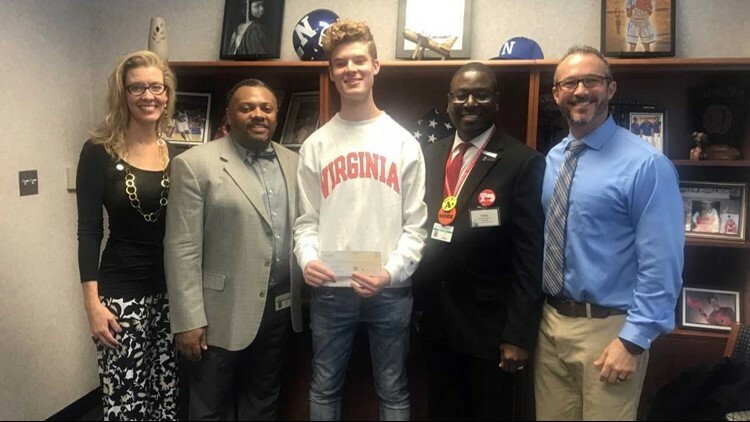 Norview High School junior James McClellan took second place, winning a $250 academic grant, in the 2018 Fall Create Real Impact contest presented by Impact Teen Drivers and California Casualty. McClellan's message reminds teens to Just Think before getting behind the wheel of a car. The high school junior hopes his video skills will help him with an acceptance to the University of Southern California's School of Film. The Create Real Impact contest, which began in 2009, rewards students, ages 14-22, for creative works that warn young drivers about the dangers of distracted driving, the number one killer of teens. “What I like best about the Create Real Impact contest is that it is all about students employing their creativity to deliver a critically important message to their peers: You can make a choice to help stop the tragedies that result from reckless and distracted driving,” said California Casualty CEO Beau Brown. The National Safety Council issued a call to action after a spike in traffic deaths over the past two years, many of which were caused by distracted driving and reckless actions. In a study by the Journal of Adolescent Health, 31 percent of Virginia teens admitted to texting while driving even though it carries a $125 fine for first offenders and a $250 fine for subsequent offenses.